Over the years, the extensive promotion of Dubai through the various landmarks overshadowed other states in emirates, but with time other emirates have emerged as deserving alternatives to Dubai. One of the best known emirates in UAE is Abu Dhabi. Did you know that Abu Dhabi is not only the capital of UAE, but also one of the best cities to live in the world, in terms of lifestyle? The city also has some of the most beautiful and largest assets in theUAE. Here are some more unknown facts about the beautiful emirate of Abu Dhabi we bet you didn't know. Did you always believe that the Tower of Pisa was the most leaning tower in the world? 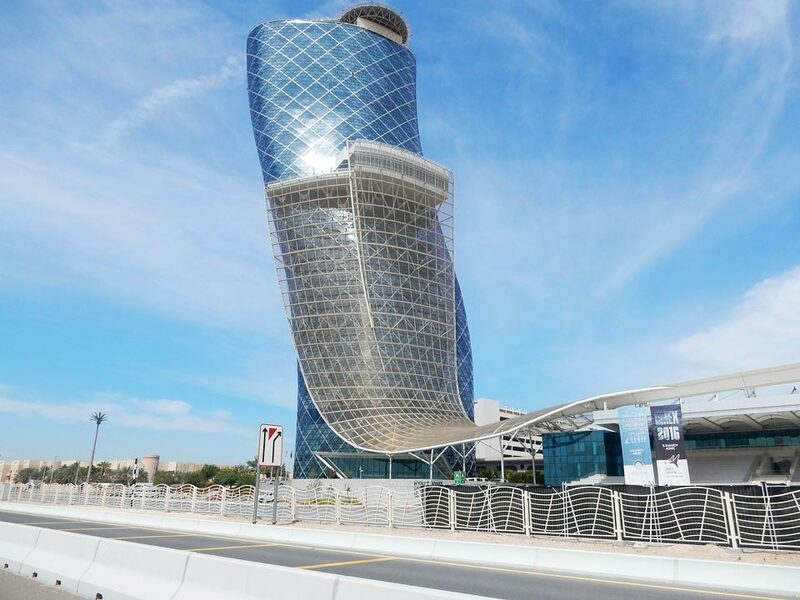 To challenge your belief we can give you the fact that the Capital Gate building in Abu Dhabi leans four times more than the Tower of Pisa. Holding the Guinness World Record for the most leaning tower at a tilt of 18 degrees, the Capital Gate is the focal point of Abu Dhabi National Exhibition Center. This modern marvel is designed to absorb and channel the forces of seismic activity and wind. It currently houses the 5-star Hyatt Capital Gate hotel and office spaces. Capital Gate building in Abu Dhabi is the most leaning tower in the world. A popular sport in UAE and other countries, camel racing like horse racing is an event for betting and entertainment, but in most of the countries children are used as Jockeys. When the camel runs, children start to cry and this frightens the camels and they run even faster to complete the race. Also, children were less fed as an increase in their weight could slow down camels while running. Considering this act as barbaric, UAE banned the use of children for camel racing. Instead, they let robots do this job. Robot jockeys are small robots that are designed to simulate a tapping sensation on camels. Fitted with voice-activated remote controls, robot jockeys are considered the most efficient means of camel racing. Also, since it is light in weight the camels run faster. Moreover, in case of an accident, it is just a piece of metal that gets damaged instead of kids getting injured. The machine starts with slow strokes and as the camel closes near the finishing line, the strokes become faster and harder. It is next to an impossible task to be able to spend time with the locals. This is because only 10 – 15% of the population are locals. Almost all of the others are expats from every corner of the earth. Holding world records is one thing, but having the biggest chandelier in the world is a marvel in its own. The chandelier at the Sheikh Zayed Grand Mosque is the biggest in the world. It weighs whooping nine tonnes. 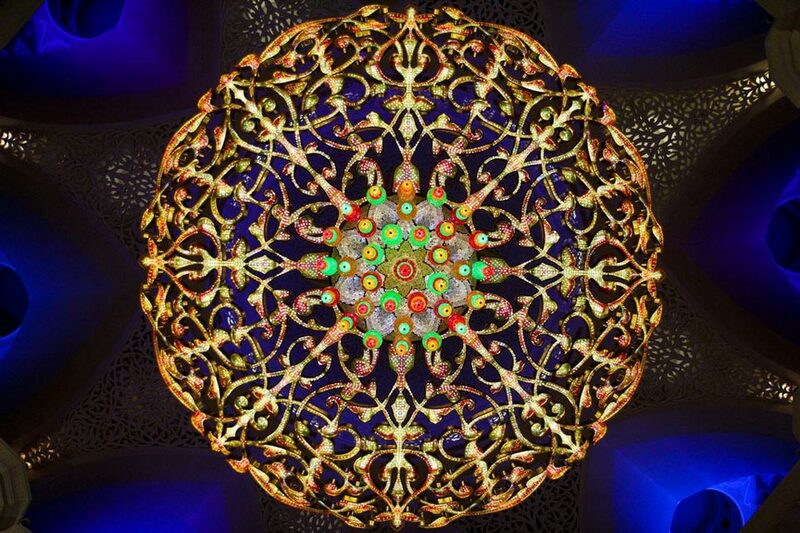 With up to 33ft in diameter and with a height of 49ft, it looks stunning when lit up. Designed to look like a date palm, this chandelier is made of millions of Swarovski crystals together with stainless steel and brass gilded with 40 kgs of 24 carat gold. The chandelier at the Sheikh Zayed Grand Mosque is the biggest in the world. Abu Dhabi holds the world record for having the world's largest carpet, which is displayed in the Sheikh Zayad Mosque. Manufactured by the Iran Carpet Company in Iran, this carpet was created in nine parts and was later assembled in the mosque. The carpet was hand woven by over 1200 workers and it boasts of 2.2 billion individual hand-tied knots. It took 38 tonnes of cotton and wool and was designed by artist Ali Khaliqi. The finished master piece weighs 12 tonnes and covers an area of 60,546 sq ft. 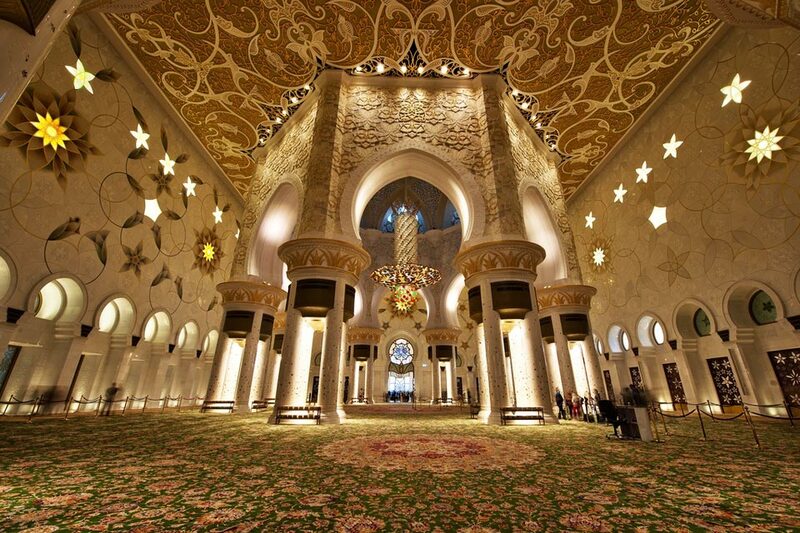 The world's largest carpet is displayed at the Sheikh Zayad Mosque. Cleaning glass panels of the Yas Hotel in Abu Dhabi is a herculean task in itself. 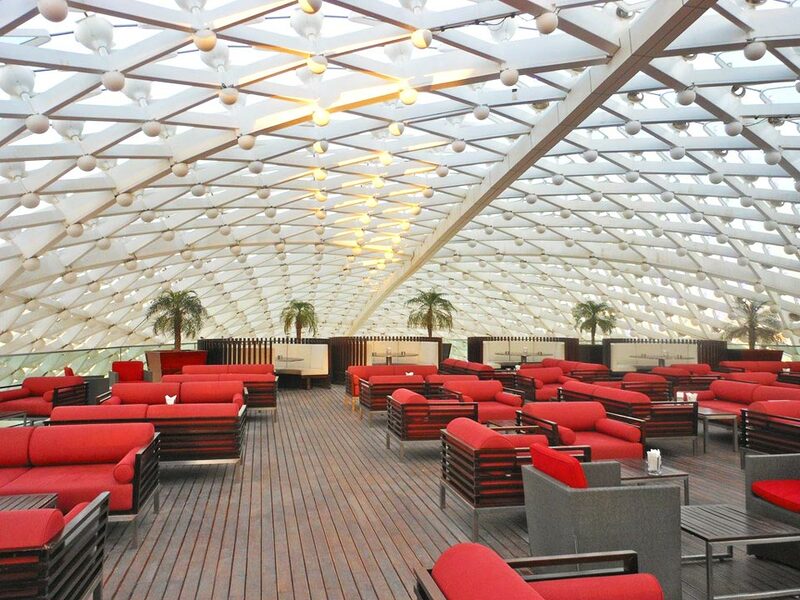 The Grid Shell of this stunningly beautiful hotel is made up of over 5,056 curvilinear glass panels. And the hotel has a cleaning staff of 15 abseiling cleaners whose job it is to keep the glass spotlessly clean. It takes them a month to clean all the glass panels of the Yas Viceroy Abu Dhabi Hotel. Can't wait to see it, can you? It takes them a month to clean all the glass panels of the Yas Viceroy Abu Dhabi Hotel. Abu Dhabi has two main sources of water – Ground Water and Desalinated Sea Water. While the ground water is the major source of water for agricultural purposes, drinking water is mainly provided by desalinating sea water across the Emirates. How can anyone go to Abu Dhabi and miss the Amazing Ferrari world? 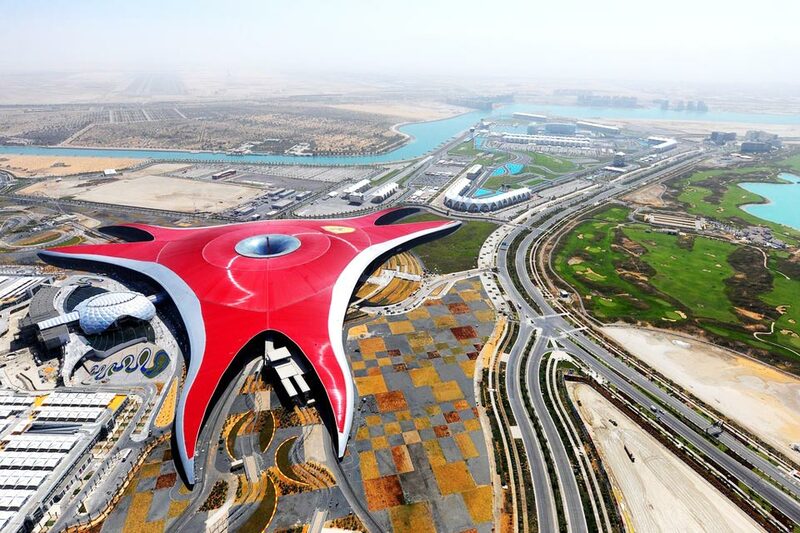 One of its kind in the world, Ferrari World is the world's largest indoor theme park. Its ride called the Formula Rossa is the fastest roller coaster around the globe. The design of the theme park is made in a way that if it is turned upright, it will become the tallest man-made structure on the planet. When in Abu Dhabi, do not miss the magnificent Ferrari World. Ferrari World Abu Dhabi is the world's largest indoor theme park. The power wagon by Dodge was the vehicle used mostly during the oil boom of UAE. The Rainbow Sheikh as he is known, Sheikh Hamad bin Hamdan al Nahyan was fond of this power machine and built the world's largest replica of the Dodge power wagon. This replica is eight times the original size of the truck and has four bedrooms inside the cabin and weighs a whooping 50 tonne. Guess what? It's not just a replica, it's a moving replica with an engine and a driver's seat. There are many more interesting facts and attractions that will make you want to visit Abu Dhabi. However, we hope these were good enough to convince you to visit this beautiful emirate of the UAE today. Hope you make it to Abu Dhabi soon! Planing to visit Abu Dhabi? Check these cameras so you don't miss that perfect photo opp. Have you ever visited Abu Dhabi? What was the highlight of your visit?